The following is a timeline of the history of the city of Tehran, Iran. 1553 – City wall built. 1723 – Afghans (Pashtuns) occupy the city. 1751 – Takht-e Marmar built. 1759 – Khalvat Karim Khani built (approximate date). 1785 – Town besieged by forces of Agha Mohammad. 1786 – Mohammad Khan Qajar moves Iran's capital from Sari to Tehran. 1790 – Palace built (later became Qasr Prison). 1796 – Population: less than 15,000. 1829 – 11 February: Russian embassy attacked; Alexander Griboyedov and others killed. 1834 – Ali Mirza Zill-i Sultan in power. 1835 – Mohammad Shah Qajar in power. 1837 – Kaghaz-e Akhbar [fa] (newspaper) begins publication. 1851 – Dar ul-Funun (school) founded. 1861 – 1 March: Unrest. 1865 – Golestan Palace rebuilt. City expanded by Naser al-Din Shah. 1872 – Jolfa-Tabriz-Tehran telegraph begins operating (approximate date). Museum founded by Naser al-Din Shah. 1881 – Baharistan Palace built. 1883 – Abyaze Palace built. 1888 – Teheran-Abd-al-Azim Railway [de] begins operating. 1889 – Imperial Bank of Persia headquartered in Tehran. 1 May: Assassination of Naser al-Din Shah Qajar; Mozaffar ad-Din Shah Qajar in power. 1899 – Tehran School of Political Sciences established. "Bast of the constitutionalists at the British legation" occurs. 31 August: Assassination of Mirza Ali Asghar Khan Amin al-Soltan. Khalil-Khan Saghfi Alam-Edoleh [fa] becomes mayor. Bombardment of Iranian parliament by Russian forces. 13–15 July: City taken by nationalist forces of Ali-Qoli Khan Bakhtiari. 18 July: Ahmad Shah Qajar in power. 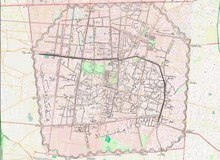 1910 – Mirza Abbaskhan Mohandes Bashi Hodud becomes mayor. 1911 – Population: approximately 280,000. 1914 – Ebrahim-Khan Yomn-Olsaltaneh Monaghah becomes mayor. 1918 – School of Law established. 1920 – Iran Club (football) founded. 21 February: Persian Cossack forces occupy city during the 1921 Persian coup d'état. 1923 – Karim Buzarjomehri becomes mayor. 1925 / 1304 SH – 31 March: Solar Hijri calendar legally adopted in Iran. 1926 – Ettela'at newspaper begins publication. 1929 – Governmental Technical Institute founded. 1931 – University of Tehran Botanical Garden founded. 1937 – National Library of Iran inaugurated. Trans-Iranian Railway (Bandar Shah-Tehran-Bandar Shahpur) in operation. Ali Asghar Foruzan becomes mayor. 1941 – Mostafa Gholi Ram [fa] becomes mayor, succeeded by Mohammad Sajjadi [fa]. Seyed Mehdi Emadolsaltaneh becomes mayor. Fazlollah Bahrami becomes mayor, succeeded by Abbasgholi Golshaeeyan [fa]. 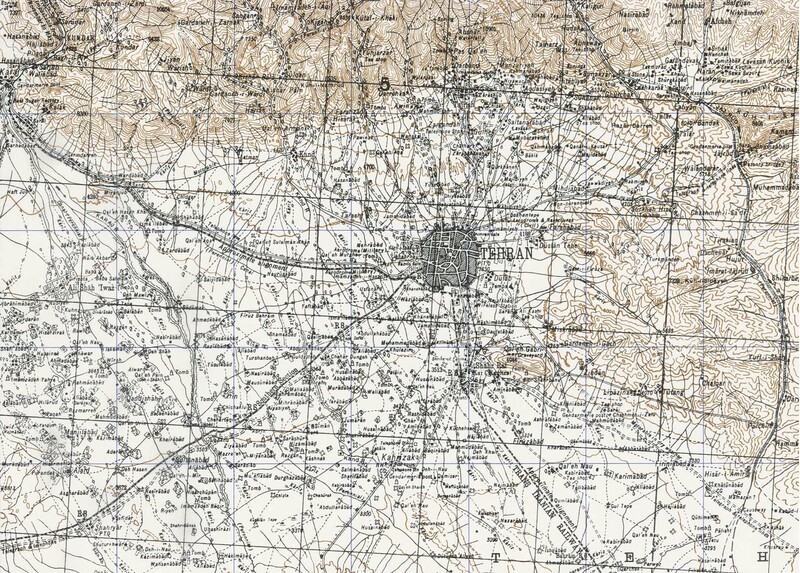 1944 – Gholam-Hossein Ebtehaj becomes mayor. Fada'iyan-e Islam (political group) founded. Mahmood Nariman [fa] becomes mayor, succeeded by Mehdi Mashayekhi. Institut français d'iranologie de Téhéran founded. Mohammad Khalatbari becomes mayor, succeeded by Hesamedin Dolatabadi [fa]. Mohammad Mehran [fa] becomes mayor. 1950 – Mehdi Namdar becomes mayor. Arsalan Khalatbari becomes mayor, succeeded by Mohammad Mehran [fa]. Embassy of the United States, Tehran built. 1952 – Nostratollah Amini [fa] becomes mayor. 1954 – Mohammad-Ali Saffari [fa] becomes mayor, succeeded by Gholam-Hossein Ebtehaj [fa]. Nosratollah Montasser [fa] becomes mayor. 1957 – Mousa Maham [fa] becomes mayor. Tehran Polytechnic and Tehran Zoo established. Tehran Biennial art exhibit begins. Central Bank of the Islamic Republic of Iran established. German Speaking Evangelical Church, Tehran built. Ahmad Nafisi [fa] becomes mayor. Ali Akbar Tavana becomes mayor, succeeded by Ziaedin Shadman [fa]. Persepolis Athletic and Cultural Club established. Higher Educational Institute For Girls founded. International Regional Cooperation for Development headquartered in Tehran. Mohandes Taghi Sarlak [fa] becomes mayor. Aryamehr Technical University and Hosseiniyeh Ershad (institute) founded. Rey and Tajrish become part of Tehran. Malek National Library and Museum opens. 1967 – Mohammad-Ali Saffari [fa] becomes mayor, succeeded by Manouchehr Pirooz [fa]. April–May: International Conference on Human Rights held in city. Tehran derby (football contest) begins. National Botanical Garden of Iran established. 1969 – Gholamreza Nikpey becomes mayor. February: International OPEC meeting held in city; "Tehran Agreement" signed. Azadi Tower and Azadi Stadium built. Teatr-e Shahr (theatre) and National Arts Museum inaugurated. Apadana Stadium opens in Ekbatan. 1974 – September: 7th Asian Games (sport contest) held in city. 16 September: Alleged UFO sighting. Carpet Museum of Iran founded. 1977 – Reza Abbasi Museum, Jamshidieh Stone Garden, and Tehran Museum of Contemporary Art open. 8 September: Protesters shot in Zaleh Square. Javad Shahrestan becomes mayor again. 1 February: Ayatollah Khomeini returns. 30–31 March: National Iranian Islamic Republic referendum held. 4 November: Students seize United States embassy and its occupants; Iran hostage crisis begins. Tehran Times newspaper begins publication. Reza Zavarehi becomes mayor, succeeded by Seyed amal ol-din Neek Ravesh. Iranian legislative election, 1980 (Tehran, Rey, Shemiranat and Eslamshahr) held. 28 June: Hafte Tir bombing. Mohammad Kazem Seyfian [fa] becomes mayor. Center for the Great Islamic Encyclopedia and Institut Français de Recherche en Iran established. Hossein Bonakdar becomes mayor, succeeded by Mohammad-Nabi Habibi. 1985 – Abrar newspaper begins publication. 1986 – Concept of "Greater Tehran" in use. 1987 – Morteza Tabatabaei becomes mayor. Tehran International Book Fair begins. 11 June: Funeral of Ayatollah Khomeini. Tehran International Puppet Theatre Festival begins. 1991 – Bahman Cultural Center opens. February: International Economic Cooperation Organisation summit held in Tehran. Iranian Crown Jewels on display at the Central Bank. 1997 – November: 1st West Asian Games (sport contest) held in city. City Council of Tehran begins. Mohammad-Hassan Malekmadani elected mayor, succeed by acting mayor Mohmmad-Hossein Moghimi. Shahid Dastgerdi Stadium and Shahid Derakhshan Stadium built. Film Museum of Iran in Bagh-e Ferdows and Iranian National Museum of Medical Sciences History open. Al Alam television begins broadcasting. February: Asian Indoor Athletics Championships held in city. Tehran Imam Khomeini International Airport opens. 6 December: Iranian Air Force C-130 crash occurs. Tehran International Tower and Bank Markazi Tower built. Ali Saeedlou becomes mayor, succeeded by Mohammad Bagher Ghalibaf. Iran Dokht [fa] magazine headquartered in Tehran. International Festival of Peace Poetry begins. Tehran Bus Rapid Transit begins operating. Safir Office Machines Museum and Mellat Cinema Complex open. January: Assassination of scientist Masoud Alimohammadi in Gheytarieh. April: International Conference on Disarmament and Non-Proliferation held in city. May: International 14th G-15 summit held in city. 2012 – August: International 16th Summit of the Non-Aligned Movement held in city. City becomes part of newly formed national administrative Region 1. ^ a b Eckart Ehlers. "Cities: Modern Urbanization and Modernization in Persia". Encyclopædia Iranica. Retrieved 16 February 2017. ^ a b c d e f g h i j k l m n Bosworth 2007. ^ Hambly, Gavin R.G. (1991). "Agha Muhammad Khan and the Establishment of the Qajar Dynasty." The Cambridge History of Iran, Vol. 7: From Nadir Shah to the Islamic Republic. Cambridge: Cambridge University Press. pp. 104–144. ISBN 9780521200950. ^ G.A. Olivier (1802), Reise durch das Türkische Reich, Egypten und Persien, während der ersten sechs Jahre der französischen Republik oder von 1792 bis 1798 (in German), Weimar: Verlag des Landes-Industrie-Comptoirs, OCLC 13068445 Quoted in: Encyclopædia Britannica, 1911. ^ a b c d Firoozi 1974. ^ Hooshang Amirahmadi (2012). Political Economy of Iran under the Qajars: Society, Politics, Economics and Foreign Relations 1796–1936. I.B.Tauris. ISBN 978-0-85772-258-4. ^ a b Baedeker 1914. ^ a b "Persia". Statesman's Year-Book. London: Macmillan and Co. 1922. ^ J. Calmard (1988). "Bast". Encyclopædia Iranica. ^ a b c d e f g h i j k l m n o p q r s t u "Previous Mayors". Tehran Municipality, Public & International Relations Department. Retrieved 4 February 2017. ^ "Garden Search: Iran". London: Botanic Gardens Conservation International. Retrieved 1 February 2017. ^ Richard Overy, ed. (2013). New York Times Book of World War II 1939–1945. ISBN 978-1-60376-377-6. ^ a b John L. Esposito (2003). Oxford Dictionary of Islam. Oxford University Press. ISBN 978-0-19-975726-8. ^ a b c "Iran, 1900 A.D.–present". Heilbrunn Timeline of Art History. New York: Metropolitan Museum of Art. Retrieved 1 February 2017. ^ Vernon N. Kisling, ed. (2000). "Zoos and Aquariums of the World (chronological list)". Zoo and Aquarium History. USA: CRC Press. pp. 369+. ISBN 978-1-4200-3924-5. ^ a b c Richard Green (2004). Chronology of International Organizations. Routledge. ISBN 978-1-135-35590-6. ^ a b Hourcade 2005. ^ Christopher Markiewicz and Nir Shafir, ed. (2014). "Malek National Library and Museum". Hazine: a Guide to Researching the Middle East and Beyond. ^ Edmund Jan Osmańczyk (2003). Encyclopedia of the United Nations and International Agreements. Taylor & Francis. ISBN 978-0-415-93922-5. ^ United Nations Department of Economic and Social Affairs, Statistical Office (1976). "Population of capital city and cities of 100,000 and more inhabitants". Demographic Yearbook 1975. New York. pp. 253–279. ^ a b c d e BBC News. "Iran Profile: Timeline". Retrieved 1 February 2017. ^ "Iran". Europa World Year Book. Europa Publications. 2004. ISBN 978-1-85743-255-8. ^ "Countries of the World: Iran". Statesman's Yearbook 2003. UK: Palgrave Macmillan. 2002. ISBN 978-0-333-98096-5. ^ Monroe Price (ed.). "Wiki". Iran Media Program (in English and Persian). University of Pennsylvania, Annenberg School for Communication, Center for Global Communication Studies. Retrieved 12 February 2017. ^ "Population of capital cities and cities of 100,000 or more inhabitants". Demographic Yearbook 2015. United Nations Statistics Division. 2016. ^ "Freak Sandstorm". BBC. 2 June 2014. This article incorporates information from the Persian Wikipedia, French Wikipedia, and German Wikipedia. S.G.W. Benjamin (1885). "The City of Teheran". Century Magazine. 31 (2). Teheran. Encyclopaedia of Islam. E.J. Brill. 1936. p. 713?+. Stephen L. McFarland (1985). "Anatomy of an Iranian Political Crowd: The Tehran Bread Riot of December 1942". International Journal of Middle East Studies. 17. JSTOR 163309. Ferydoon Firoozi (1974). "Tehran: A Demographic and Economic Analysis". Middle Eastern Studies. 10 (1). JSTOR 4282511. Mansoureh Ettehadieh Nezam-Mafi. "Patterns in Urban Development: the Growth of Tehran (1852–1903), in Edmund Bosworth and Carole Hillenbrand, eds., Qajar Iran: Political, Social and Cultural Change 1800–1925 (Costa Mesa: Mazda, 1992), pp. 199–212. Ali Madanipour. Tehran: The Making of a Metropolis (New York: John Wiley, 1998). Xavier de Planhol (2004). "Tehran". Encyclopædia Iranica. C. Edmund Bosworth, ed. (2007). "Tehran". Historic Cities of the Islamic World. Leiden: Koninklijke Brill. pp. 503–519. Aḥmad Monzawī; ʿAlī Naqī Monzawī (2012). "Bibliographies and Catalogues in Iran: Tehran". Encyclopædia Iranica. Xavier de Planhol. "De la ville islamique à la métropole iranienne: quelques aspects du développement contemporain de Téhéran," dans Recherches sur la géographie humaine de l'Iran septentrional (in French) (Paris: 1964). Paul Vieille. Marché des terrains et société urbaine. Recherche sur la ville de Tehran (in French) (Paris: Anthropos, 1970). Chahryar Adle; Bernard Hourcade, eds. (1992). Téhéran capitale bicentenaire. Bibliothèque Iranienne [de] (in French and English). Paris: Institut français de recherche en Iran. ISBN 2-87723-055-4. Bernard Hourcade (2005). "L'émergence des banlieues de Téhéran". Cahiers d'études sur la Méditerranée orientale et le monde turco-iranien [fr] (in French) (24: Métropoles et métropolisation). Mina Saïdi-Sharouz, ed. (2013). Le Téhéran des quartiers populaires: Transformation urbaine et société civile en République islamique (in French). Paris: Éditions Karthala [fr]. ISBN 978-2-8111-0931-8. "Tehran". Islamic Cultural Heritage Database. Istanbul: Organization of Islamic Cooperation, Research Centre for Islamic History, Art and Culture. Archived from the original on 2013-04-15. ArchNet. "Tehran". Archived from the original on October 2012.